The Alliance of Liberals and Democrats (ALDE) in the European Parliament have just confirmed that they will reject ACTA, the Anti-Counterfeiting Trade Agreement. Leader of the Alliance, Guy Verhofstadt, said that while supporting the protection of intellectual property rights, ALDE believes that ACTA falls short on a number of counts. The Anti-Counterfeiting Trade Agreement, a treaty aimed at harmonizing global copyright enforcement, received yet another serious setback today. The Alliance of Liberals and Democrats in the European Parliament have just announced that they will reject the controversial treaty. “Although we unambiguously support the protection of intellectual property rights, we also champion fundamental rights and freedoms. We have serious concerns that ACTA does not strike the right balance,” announced Guy Verhofstadt, ALDE group leader. Verhofstadt said that ALDE continues to support multilateral IP enforcement efforts, but only those with a transparent, publicly discussed mandate. He added that ALDE shares the legitimate concerns of those who participated in the anti-ACTA protests in recent months. “Civil society has been extremely vocal in recent months in raising their legitimate concerns on the ACTA agreement which we share. There are too many provisions lacking clarity and certainty as to the way they would be implemented in practice,” Verhofstadt noted. 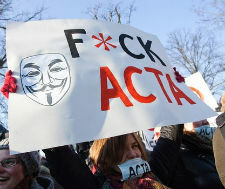 One of the key problems raised by anti-ACTA activists is the way the treaty has morphed and grown since its inception. From its roots as a mechanism to deal with counterfeit goods, ACTA grew to encompass the unauthorized sharing of digital media online. This means that from targeting strictly criminal enterprises, ACTA now risks sucking in the man in the street. This one-size-fits-all approach is opposed by the Alliance of Liberals and Democrats. Yesterday the European Data Protection Supervisor (EDPS) said that ACTA may have unacceptable side effects on fundamental rights of individuals. “While more international cooperation is needed for the enforcement of intellectual property rights, the means envisaged must not come at the expense of the fundamental rights of individuals,” assistant European data protection supervisor Giovanni Buttarelli said in a statement. Final Europarl Committee Rejects ACTA: Internet-Lobbyists, 5-0.
c There are 78 comments. Add yours?